The Dremel 4200 variable speed rotary tool is the first ever rotary tool with the EZ Change mechanism for the easiest and quickest accessory change. The innovative EZ Change system is the fully integrated quick-change mechanism that allows easy and fast accessory changes without a wrench. Now, completing projects will be more convenient and faster than ever before. 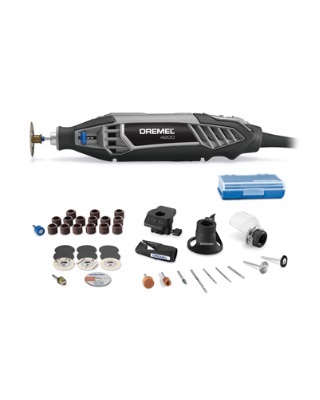 Offering the highest performance and most versatility of all Dremel rotary tools, the Dremel 4200 features electronic feedback circuitry that enables consistent performance at all speed levels. Dremel 4200 can use all current Dremel rotary tool accessories and attachments to complete the widest range of projects.The 4200 has a separate on/off switch and variable speed dial that allow convenient speed adjustment and maintaining the selected speed even when tool is turned off. Adapter and drive coupler for attachments 225, 575 and 670.